On Saturday, September 2nd, DuBose Law Firm held a Hurricane Harvey supply drive at our offices. Beaumont trial attorney, Scott Frederick, was stuck in Dallas on business earlier in the week. Frederick decided to ride out the storm in Dallas and rent a moving truck to take back to Beaumont with supplies. The moving truck was at DuBose Law Firm by 8:00 a.m. on Saturday and we began receiving supplies immediately. Beaumont officials sent Scott Frederick pictures via text and social media of the supplies most needed at the local shelters including water, cleaning supplies, paper towels, diapers, powdered milk, personal hygiene products, and other necessities. By 11:00 a.m. the truck was full! Mr. Frederick’s journey back to Beaumont did not end until approximately 11:00 p.m. on Saturday. 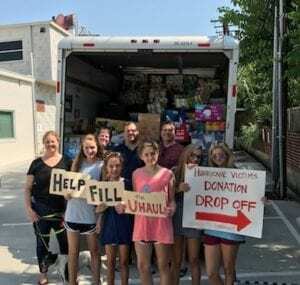 The moving truck was loaded down with nearly 5,000 bottles of water and other supplies and required frequent stops for gas. Supplies provided relief to residents of both Beaumont and Port Arthur, Texas. The supply drive came together within just 48 hours. Kathleen Kearney, a local attorney, contacted both Scott Frederick and Ben DuBose to organize the event. Social media and email were used to get the word out. Generous donations were made by members of the Dallas Trial Lawyers Association, students and parents of Woodrow Wilson High School and J.L. Long Middle School, as well as the Dallas A&M Club, Holy Trinity, and other local churches. Thank you to everyone who volunteered and/or donated for this worthy cause. Vermiculite, a naturally occurring mineral, was mined and processed in Libby, Montana, from the early 1920s until 1990. 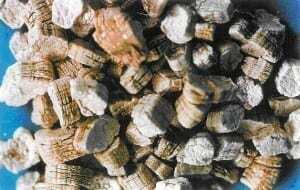 This vermiculite, which was shipped to many locations around the United States for processing, contained asbestos. At the Texas Vermiculite Company/W.R. Grace site in Dallas, Texas, more than 396,900 tons of asbestos-contaminated vermiculite were shipped to that location and a facility at the site expanded vermiculite using an exfoliation process. Commercial exfoliation of vermiculite is a process of heating uniformly graded pieces of vermiculite in a furnace to expand or “pop” it into lightweight nuggets. Expanded vermiculite had excellent insulation properties and was widely used for attic insulation, among other uses, during the second half of the 20th Century. The Dallas vermiculite facility operated from 1953 to 1992. The buildings at the plant were demolished in the early 2000s. A residential neighborhood is within a quarter mile of the former vermiculite expansion plant. Thousands of people lived within a mile of the facility while it was still in operation. While the facility was operating, workers at the facility and members of their households were exposed to asbestos from the processing and handling of asbestos-contaminated vermiculite and waste rock. Neighborhood residents could have been exposed to asbestos from the plant operations either from the manufacturing operations themselves or from stockpiles of asbestos-laden vermiculite on the property. The vacant property most likely no longer poses a health threat to the community. However, individuals that lived in the neighborhood before 1992 should be aware that they may have experienced environmental exposures to asbestos from the facility and should mention this potential exposure when during routine medical check-ups. The Agency for Toxic Substances & Disease Registry (ATSDR) has conducted an extensive review of the Dallas expansion plant. In the mid-2000s, health screenings were conducted at Parkland Hospital for west Dallas residents who lived near the W.R. Grace facility prior to 1992. Radiology for a number of individuals found evidence of asbestosis. If you lived, worked or attended school near the Texas Vermiculite/W.R. Grace vermiculite plant in west Dallas prior to 1992, you should consult your physician concerning regular screenings for potential asbestos related illnesses.